We're a leading supplier of a complete range of products, from power generation and irrigation systems to automation and landscaping, to ensure optimum power and water management solutions. Headquartered in Riyadh, Saudi Arabia, Abunayyan Holding is one of the longest-active companies in the power and water business, and has grown to accommodate around 4,500 employees spread across its subsidiaries in the Kingdom and throughout the Middle East and Africa. Founded in 1950 to supply diesel-powered water pumps to farmers, permanently transforming the nation’s irrigation methods, the company that began as a family business has blossomed into an impressive portfolio spanning more than a dozen strategic business units that provide integrated solutions for water, power, oil and gas. 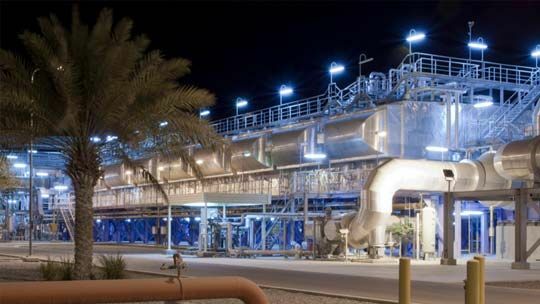 With its roots firmly planted in Saudi Arabia and the Kingdom’s development, Abunayyan Holding offers turnkey solutions through core activities including engineering, manufacturing, supply, construction, and service. As one of the longest-active companies in the water and power business, Abunayyan Holding has the experience and expertise to be a reliable partner for all stakeholders including our customers, business partners, employees and shareholders. We partner with the most respected international companies to develop and bring new solutions to the market. Our technologies increase the sustainability of Saudi Arabia’s water and energy resources through innovative technology and engineering. Abunayyan Holding has evolved hand in hand with the Kingdom’s development, growing together while retaining core values. We are committed to developing human capital, from investment in training for our people throughout their careers to offering opportunities for the next generation of Saudis – our youth – while respecting and protecting local values and tradition. Since the beginning, Abunayyan Holding has innovated to address Saudi Arabia’s toughest challenges – transforming the way the population harnessed the Kingdom’s scarce water resources. Today, more than 60 years later, the company’s strategic business units continue to innovate and partner with international leading companies to maximise water and energy resources. Combining local knowledge and international expertise, Abunayyan Holding and its affiliates are competitively positioned to serve Saudi Arabia and the wider region for all their water and power needs.